3:37 I'm done for the day. Hope you learned something about trading dull days. Thanks for coming. See you next week. Take some courses. 3:35 I give thanks and quit now. Narrow range days can be traded, but it takes patience, skill, and good tools. that dictated my entry price choice. 12:28 from the high near 10:28, I see 7 small swings-a small down Chaos Clamshell. 12:19 many of my discoveries have come from placing a mylar sheet over a screen, sketching, and measuring. when I do that on a two day chart I can draw a horizontal line at 1368 and an arc over the top of prices. these meet about 13:20 or so. This suggests possible increase in energy near the next trade time. 12:10 on the Wheel, see Jupiter, then Venus set highs, and below have Sun/Neptune/Chiron support. 11:54 I updated that chart. The CCT room lets CCTs post charts and discuss them in a secure environment. 11:43 in slow markets, one of the better tools to use is the Fractal Grid from the Chaos Trading Made Easy course. 10:34 stopped for -2. That's OK. have two more trades today, and about 10 to 15 next week. On low volatility days, the odds of a trade not working are higher, so one needs to control the loss, and not lose patience or poise. 9:56 in daytrading, it is very important fo use profit targets, and not count on long trends with trailing stops. 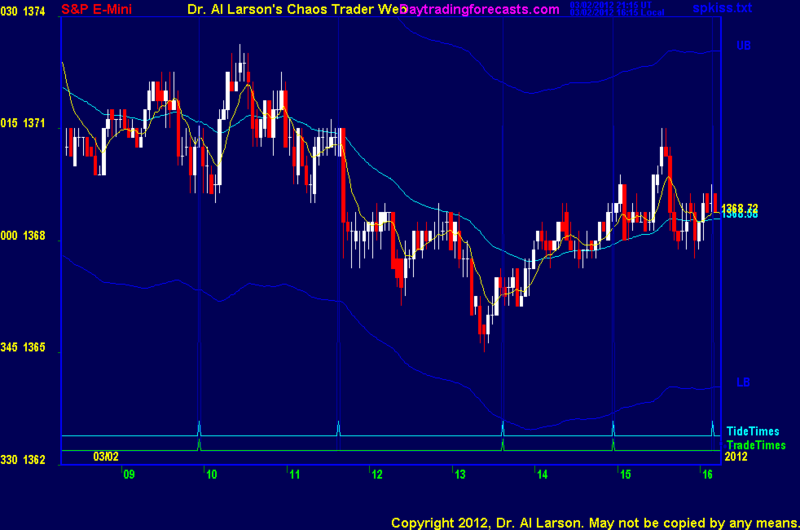 A target of .25 or .33 of the recent daily ranges or expected range is good. Today I expect a range of 9 or less, so a 2 - 3 point target is reasonable. 9:52 getting some selling going into the trade time. I want to see how we come out of the trade time. 9:48 I pay attention to the size of the 3 minute candles. Candles of 3 or fewer ticks say there is no excitement. 9:42 when volatility is low, I usually wait until the trade time before making an entry. periods tend to come every 11 to 13 months, and tend to last 4 to 6 weeks. So wixhing for a better day is pointless. Traders have to learn to deal with such days, so I'll talk about that today. 3/2/2012 1:58:09 PM MT srj****:: In terms of copies - only a public Library in FL has a copy. 3/2/2012 1:57:06 PM MT srj****:: Last time I phoned Wilbur register - they said some one else also wanted it - but they had contact only to one of the daughter-in-law of Owen Lehto and She looked after matters related to the book. May be time to check again. 3/2/2012 1:54:37 PM MT AG:: I received an e-mail from the distributor today saying the book is out of print and that they do not carry it in inventory. 3/2/2012 1:53:49 PM MT Al****:: I just got an email from Acres USA saying the book is out of print, and the page found is an old one cached by Google. 3/2/2012 1:51:17 PM MT srj****:: Please ask MS if he got the book - last time I ordered but found out I think the order handling company might have back dated pages. 3/2/2012 1:49:32 PM MT srj****:: Al I did and sent you an email. 3/2/2012 1:35:26 PM MT BBB****:: Al - ironically on a down grid (i updated mine too) this streak came right as prices past the last grid line. 3/2/2012 1:21:32 PM MT SSP:: If one of u more experienced guys cud look at aapl daily and tell me if thats a 7 ? 3/2/2012 12:26:40 PM MT SSP:: looks to me like this could be 6 and another leg what do u think? 3/2/2012 11:35:05 AM MT Al****:: AG-no. 3/2/2012 11:25:26 AM MT BBB****:: Wait till you see the updated grid. 3/2/2012 11:18:26 AM MT AG:: Al, does the direction of the corresponding move in the discontinuity ever give you a reasonable gauge as to which MT is dominant? I've noticed sometimes that even though the discontinuity points down (and the market also goes down) that it doesn't necessarily mean we end up following that MT. 3/2/2012 10:23:32 AM MT Tg****:: A lot of times both directions will have periods in the day when they are both working. Unless a definitive down move takes place to take price clearly to the downside OOB (not just a touch and reverse off of it) don't be surprised to see the up FG working off of the early upstreak. 3/2/2012 9:38:21 AM MT BBB****:: Move 4 of 7? 3/2/2012 9:20:04 AM MT BBB****:: Tg- check the CCT room. I did the grid as if the initial thrust down was impulsive, and it is seeming to fit. 3/2/2012 8:34:47 AM MT BBB****:: Good Point. I don't see it colored to the upside either, so I guess we just wait to see what pans out? 3/2/2012 8:31:53 AM MT Tg****:: BBB, was it a chaotic thrust or just a corrective thrust. Looking at Al's CTME chart I don't see the QPFE colored up to the downside. 3/2/2012 8:26:15 AM MT Tg****:: On a chart just using the outcry session, price squatted on the lower 55 minute donchian channel for a while without breaking it(four 1 minute candle touches) then popped up. 3/2/2012 7:49:16 AM MT ms:: what colors are the 110 and 440 exma's? 3/2/2012 7:42:02 AM MT Al****:: Wave59 is all the work of Erik Beane. He was a student of my basic 4 courses. I did help him very eary on when he was just starting it as a recent college graduate. I told him I sure did not want to do a real time trading program, because of the support demands and the challenge. Erik wanted to do one. He figured it would take him a few months. A couple of years ago he told me it took him 7 years to get it all working right. That's dedication and persistance. My hat is off to him. 3/2/2012 7:29:39 AM MT BBB****:: I have been on Wav59 for 2 weeks and like a few of the options it has. ITs 9-5 count is great, and the Ultra-smooth momentum is excellent. Works well with Al, in my opinion. 3/2/2012 7:15:55 AM MT sdg:: Great, thank you. Very interesting demos; can't help but think that you may have played a large part (directly or indirectly) in that development. 3/2/2012 7:04:11 AM MT sdg:: GM all--Al, reviewing wave 59 per your suggestion. Are the times that can be established from the ephemeris similar to your trading times? 3/2/2012 6:04:29 AM MT SSP:: question: Yesterday I had the nice short on the cross but ended up breaking even on the trade is there anything I should have seen that indicated to take profits ? 3/2/2012 6:01:32 AM MT SSP:: gm all, nice move on the EUR over night.